A particularly interesting image is a photo of Minna Citron standing next to TVA Power, an in-progress mural that she was creating for the Newport, Tennessee post office. 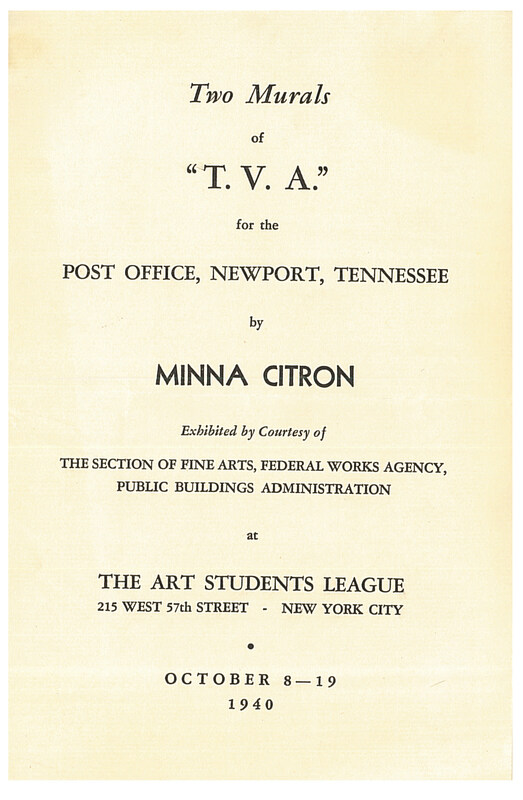 Citron painted murals and taught art as part of the Works Progress Administration’s Federal Art Project. 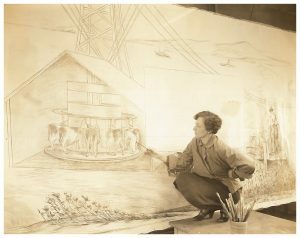 The photo serves not only as a great image of Citron in her element but also allows historians to view how the mural was created and how it looked in the 1930s. Often the large, impressive murals created during the time of the New Deal were destroyed or neglected and left to ruin over the years. In many cases, photos of these murals are the only way they can be seen and can be very important in the study of an artist. 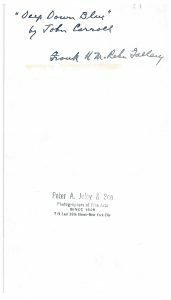 The AA/PG Library actively collects research materials on WPA artists in order to support the Smithsonian American Art Museum’s unmatched collection of New Deal art. 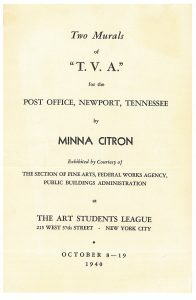 Some of Minna Citron’s papers are held at the Archives of American Art. Also on exhibit is a photograph of the portrait Deep Down Blue painted by the artist John Carroll. 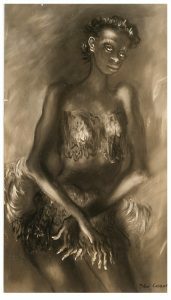 Carroll was well known for his portraits of women with accentuated eyes and peculiar, intense expressions. In Deep Down Blue we see a clear example of this theme as the woman, described as a burlesque dancer, looks at the viewer under heavy eyelids, her eyes still bright, with a subtle smile. John Carroll was also an art teacher at the Art Students League of New York as well as the Arts and Crafts Society in Detroit. On the back of this photograph is a stamp indicating that the photo was produced by Peter A. Juley & Son, a well-respected fine art photography firm in New York, active from 1906 to 1975. 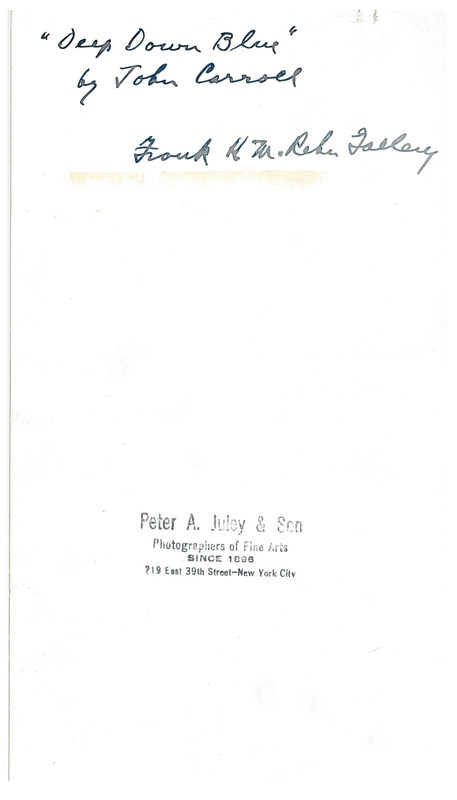 In 1975 the Photo Archives of the Smithsonian American Art Museum received what would become the Peter A. Juley & Son Collection which consisted of 127,000 photographic black-and-white negatives of 11,000 American art and artists, including many images of Carroll’s works (including Deep Down Blue, in the original frame). Just like photos of murals, photos of paintings can be a valuable source of information about the artist and their art especially if the artwork is damaged, altered, or missing. Carroll has a presence in several other collections throughout the Smithsonian including paintings in the Smithsonian American Art Museum collection and a selection of his papers in the Archives of American Art.